Another eye-roller: Global warming will make you sneeze more | Watts Up With That? Eric Worrall writes: We’re all set to sneeze more often as the globe warms, according to a new study published in PLOS One. As someone who suffers asthma and hay fever, and who lives on the edge of a large tropical botanic garden, I’ve got some simple advice for anyone worried about rising pollen levels in a warmer world. Rather than shutting down industrial civilization, buy the full strength anti-histamine pills. November 6, 2014 in Alarmism. Well I have a simple solution. Kill all the plants. There, thats done. You may laugh. Extreme Green holds that all life is a ghastly mistake and the planet should be returned to sterile simplicity. If that’s the case, “Extreme Green” isn’t green at all. Instead of green, they should refer to themselves as a brown movement. Extreme Brown would be more appropriate, since papers like this one are huge steaming ploppers. Published in PLOPPER One. Removing all CO2 “pollution” from the atmosphere would do just that — kill all the plants, and then all the animals, too. On the bright side, there would be no more allergies. So, in that sense, CO2 does cause allergies, but the cure is worse than the disease. Pssst! Don’t tell mankind that CO2 is essential plant food. This information is not political correct any more! Well, that’s a striking example of the ruling climatism ideology of our age – unfortunately! Hey, they are already trying to starve them.. what’s one step further !! Total rubbish. I have been a hayfever sufferer since birth. You do not ”catch it” you are born with it. It can be easily controlled with a tablet a day. Not quite. It’s an immune system response that’s acquired by exposure to an allergen. From personal experience, medication isn’t always a help, but the reaction can diminish over time. I agree there are some people who have a severe reaction to allergens. However all but the most extreme alarmists understand we won’t be hitting 800ppm for at least a few decades. If the science of treating immune response disorders hasn’t advanced dramatically, long before the CO2 levels described in the abstract become a reality, I shall be very surprised. I have sufferd from asthma since a child and it was bad enough that I used the relevant puffers severl times a day. Twelve years ago I went into hospital for a minor operation and went under the anaesthetic. From that day to this I have not suffered from asthma . During the peak of the hay fever season I will be aware of runny eyes sometimes which, tragically, prevents me cutting the grass, but that’s it. How this happened I do not know and no doctor has seemed interested in investigating. I grew up on the outskirts of London [to the NWxW 1/2 N – I’m not doing quarter points! ], and I had no ‘hay fever’ symptoms. I went to sea. Fine. I did a summer at HQ (EC2Y 9BR), so pretty central. I found I had ‘hay fever’ – probably more related to diesel particulates than pollen. … and killer poison ivy. You’re gonna need an ocean, of calimine lotion. Poison ivy! That’s a good one! POISON IVY TO SPREAD UNDER GLOBAL WARMING. AP. Scientists say…..
what’s “funny” is that the MSM articles say that the urushiol (the poison or skin reacts too) is also stronger- “There was a nonsignificant (P = 0.18) increase in urushiol concentration “. However,(Duh), C02 causes more plant growth, and the bigger plants have more urushiol per plant…..
Warmer and more CO2 means more pollen. It also means more plant life and thus more food. And all this alarmist propaganda pseudo-science horse dump gives me diarrhea. Goodness it’s getting deep. We need a new band wagon! Atishoo atishoo we all fall down! I think the green horse throo a shoo on this one. Hey, this one may even make some sense! But it comes with a negative feedback that they conveniently ignore. As more and more people suffer more and more from more and more severe allergic responses, more and more would be investigated on that field until a better solution was found and nobody had allergies any more, therefore reducing the sneezes. See? 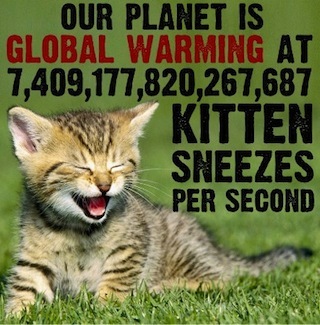 That should be “Global warming Hysteria will make you sneeze more”. I am allergic to the stupidity of the alarmists. Ringo Starr was talking about global warming in his song “no thank you please”? That’s a Hoyt Axton song, son. It sounds like they’re running out of things caused by CAGW. Road Rage/Melanoma/Athletes’ Foot/Marriage Breakup/Alcoholism/Flea Infestation/Mental Illness/Petrol Prices/Voting Irregularities/Homelessness. There you go. Plenty for at least 12 month’s supply of Press Releases. Well, here in MD, the way to lower gas prices is raise the gas tax. I kid you not, our current esteemed Lt. Governor (soon to be Ex Lt. Governor) said so during the just ended campaign! So, taxing CAGW should lower the temp if we extrapolate correctly. You forgot dog poop from the LA.Times. The EPA says we should flush it. Just google L.A. Times dog poop for yet more stupidity. You omitted the most important one: inflamed hemorrhoids (because they surely are a pain the the rear). Did the dinosaurs sneeze a lot? Pollen is found as far back as the Devonian. I think it got really warm back then…. Nice to see basic factorial/replicated experimental science still happens. I wonder though about their assumptions on the health impact. Given pollen is fairly ubiquitous in areas with grasses, is the health response to more pollen really expected to be linear? It would seem there is at least a diminishing returns function, and in some areas may already be functionally saturated from a health perspective. Besides, I thought all these plants were maladapted to a changing climate. How will they produce more pollen if they are dead? Perhaps the learned scientists can tell us what causes asthma. The simple fact is that the cause and cure of asthma remains unknown. Trying to tie a disease to climate change, when the cause of the disease is unknown is the worst kind of rubbish science. Perhaps global warming holds the cure for asthma. Not saying it does, only that since no one knows the cure, you can’t rule out any possibility. So, it could easily be said that global warming could reduce asthma. Don’t the CAGW hopeful say the Climate Change is going to bring about more droughts and heatwaves, that will kill off the plants and thus reduce pollen? So is this another case of global warming causing more/less snow/ice/whatever? What next. Global warming will cause people to grow taller/shorter? Clearly it isn’t making them any smarter. Amazing. $100 billion in climate research to discover that CO2 makes plants grow faster. That was my thought exactly. So what is new about this??? Nothing!! The modern science culture is SO screwed up. Fortunately we now have a congress which can put an end to this kind of useless research. Does Al Gore have stock in Kleenex? He should be looking to buy the company that makes the Dollar General Substitutes. yet my allergies act up more in cooler weather, 38- 40’s (F) and raining kill me. Exactly why this generalization is so ludicrous, since people tend to react to various allergens in different manners under different conditions, if there is a reaction at all. These folks are committing credibility suicide. Soon even those with below average IQ will begin to find discrepancies. ps. Can you add CC to your blogroll?? Lets hope is does not affect the nearly extinct polar bears and beached walruses, and make the Emperor penguins cough on their way across the vast areas of disappearing ice. Might get that damn snail that refuses to go extinct when told though. and that is the mega problem- the spread of non -indigenous species causing the problems usually blamed on climate change- more fires, decline in indigenous species. Remember, allergic individuals started moving to a mostly desert Phoenix city to avoid asthma, then they started planting grass and trees shedding ………….Then they moved to Tucson and started….. Same results. CO2 is our only gaseous fertilizer. Unless the level of global CO2, climate, temperature etc are at some sort of optimal level for all living organisms (unlikely!!) then it must be the case that there are advantages and disadvantages to a changing climate. Continual scare stories about the dire consequences of increased CO2 and associated temperature rises is fundamentally unbalanced. They further assume that no adaptation take place despite the ability of living organisms to evolve naturally, and (over varying timescales) are mobile. Feeding the public with ever more negative impacts is clearly failing to materially change public perceptions on the issue. Greater balance in the research and arguments may lead to a more informed debate that a case for action is sensibly being made on the balance of probabilities. We are “all gonna burn” and in this research “all start sneezing” are clearly not effective arguments. We still have not conclusively demonstrated that increased CO2 is responsible for climate change. Nor does model performance against actual data increase confidence that all the feedback loops and natural processes have been fully understood and properly incorporated into models. However, I don’t think the issue here is climate warming or climate change. The issue is CO2 itself. Clearly it has been increasing. I will not speculate on the source of this increase or if it is responsible for climate change. The increase in CO2 concentration is clear and the beneficial effects on plants are clear also. However, too much of a good thing can begin to induce detrimental effects. I don’t really care about being quoted that much higher CO2 concentrations existed before, this is irrelevant to plant growth and food production under the conditions we have today. When following the increase in CO2 concentration, I always see the graph from the one location in Hawaii. NASA will start publishing CO2 concentrations distribution from satellite measurements early next year. We may get some surprises. The is one flaw in all the “global warming will cause” prophecies. Moving towards the equator a bit will raise the ambient temperature of your surroundings. Instant global warming. More contrived nonsense designed to trigger a funding reposnse by way of a grant application. This is the sort of transparent rent seeking that would not be toelrated if AGW was infact a serious issue of any merit. You see that parked car down there, a block away? When it hits you at 20mph, it will injure you very seriously, probably breaking bones. If it happens to be going 50mph, it will very likely kill you. That parked car down there. A block away. The BBC series Horizon did a programme about allergies a couple of months ago, called “Allergies: Modern Life and Me”. Inasmuch as it can be summed up in brief, we sophisticated moderns are mucking up all sorts of aspects of our relationship with our microbiota – but like all good science there are a lot of wrinkles, and it made an interesting hour’s viewing. The programme has timed out on the iPlayer, but there must be a copy somewhere. There usually seems to be. I bet they never even bothered to take a look at workers in Greenhouses with higher temps and up to 1200 ppm of co2. So let’s start with the Netherlands- The Netherlands has around 9,000 greenhouse enterprises that operate over 10,000 hectares of greenhouses and employ some 150,000 workers. Do greenhouse workers suffer from a higher degree of allergic and asthmatic symptoms? interesting, the book seems to have looked at a more realistic view than the report above. now we have to evaluate the closed conditions of the greenhouse and florists. What temps and levels of co2. Workers in low co2 vs increased co2. Varying temps .Is it just the increase of flowers per square foot. I should add or more cats. answer is Yes, but your question is not a relevant comparison. The confined air nature of a greenhouse means airborne pollen levels are far more elevated simply due the lack of air exchange rather higher CO2 induced pollen production. indeed, the experiment above shows an increase in pollen , does this necessarily mean more levels of of allergic and asthmatic symptoms? I am allergic to cats, will bigger cats make me worse or will more people suffer an allergy from being around bigger cats. More BS published without question here in Auckland by the NZ Herald and NZTV. I wonder why they bother to employ “reporters” if they cannot question this sort of garbage. Well, maybe their days are numbered – we can always hope so. The paper is reasonable. The authors’ conclusions, not based on Climate Change per se, but on elevated pCO2, are sound at the tested pCO2 of 800 ppm. CO2 does everything but cure cancer. If it could only cure cancer it would be complete in its existence. They are getting close! Next a cure I hope. Lasers are named for the liquid, gas, solid, or electronic substance that’s used to create the light. Many types of lasers are used to treat medical problems, and new ones are being tested all the time. Today, 3 kinds of lasers are commonly used in cancer treatment: carbon dioxide (CO2), argon, and neodymium: yttrium aluminum garnet (Nd:YAG). .. Wait a minute. They experiment on plant growth by raising CO2 and O3 and got the results you would expect. Then they conclude “our findings provide evidence for significant impacts on human health worldwide as a result of future climate change”. Am I missing something? This experiment seems to have nothing at all to do with climate change. I’m going to go and cut my toenails now. This will cause Global Warming. What do you mean, prove it? I have said that it will. Send money and I MIGHT publish my hypothesis. Turn off the air conditioner and open your windows for your newborn infant to breathe the allergens because that first year is when our body’s immune system has to “learn” what it has to deal with. Very few people who grow up on farms, especially in Amish areas, develop allergies and asthma. Let kids play in the dirt. And then the proposition that C-section babies are more susceptible to allergies. Not picking up bacteria as they pass through the birth canal. Another suggestion has been the new super cleaners that kill all the bacteria around the house, no playing outside etc- so children don’t come in contact with bacteria as much as before. Since a large part of our immune system is in our gut, it helps when the gut has a proper balance of microorganisms. Even a baby delivered by C-section can get a lot of help with that from having access to mother’s milk. Failing that, access to unpasteurized cow’s or goat’s milk can be helpful. These days, in modern societies, it is likely that babies will lack sufficient numbers of the “good” bugs in their gut. It’s no coincidence that the “good” bugs are going missing since so much of our food and water (not to mention vaccines) contain persistent germ-killers. Glyphosate (a/k/a the herbicide Roundup), which was originally patented as an antibiotic and chelator, and is used on so much of our food supply, preferentially kills off the “good” bugs, thus leaving other microorganisms like fungi to take over. I have seen papers that describe how Glyphosate actually enhances the growth of fungi. It has become more and more common to see health authorities recommending their patients take probiotics, especially after a round of antibiotics. There are many different strains of probiotics available. I think it’s a good idea to take a variety of them. In addition, raw organic fruits and veggies (not to mention raw dairy, but that’s hard to get) can be a good natural source of them, as long as you don’t try to sterilize them. As I have experimented with various products and foods, one that surprised me was organic iceberg lettuce. Then again, maybe it wouldn’t be such a surprise if one remembers that cabbage can be made into sauerkraut with no other inoculation than the lactobacteria (some of the “good” bugs) that naturally reside on its leaves. So what does this have to do with allergies? Well, I thought I had developed either gluten intolerance or a wheat allergy, and (long story short) discovered that as long as I avoid the chloraminated tap water and other killers of “good” bugs, I can eat wheat without troubling my gut. AFAIK, there is no clear connection between the incidence, or severity, of asthma and pollen or other allergens. Indeed, the steep rise in the incidence of asthma over the last half century or so is a mystery. This is especially so as the air in urban environments has actually become progressively cleaner. Theories have included that living in cleaner environments makes people more prone to asthma (lack of exposure to various bugs and irritants), but no-one really knows. How so-called “scientists” can spout such nonsense in academic papers, when a couple of hours of research quickly shows this to be a crock, just highlights once again the degraded state of post-modern science. Wonder if it will make you bald or lose at blackjack…. Hopefully we can end all carbon pollution and enter back into the glorious glacial conditions where the sneeze to freezing to death ratio will decrease. I, like many other commenters here, see that this is an admission that global warming will make the world a more food productive place. Who said the world would be a poorer place if the climate warms and CO2 levels increase? All of us except asthma sufferers should be rejoicing if CO2 is really warming the planet! I’m sure the asthma sufferers will make do as well. I have had asthma for all my life. O2 global crop production is plus 30 to 40 percent with no increase in water or land, then I will use my inhaler a couple of more times each month. 800 PPM of CO2 would have that much affect on crops. They just keep coming up with one contradictory scenario after another and calling it “science!” The master plan seems to be: “Convince the masses that no matter what happens—drought, flood, heat wave, deep freeze, animals dying off, animals multiplying, crop failure and now overabundance of plants—it’s ALL caused by how we travel and heat our homes.” How can anyone with a functioning frontal lobe believe this horse pucky?